Finding the perfect outfit for your wedding is a monumental task and trying to find your perfect colour, silhouette and style just doesn’t seem easy at all! 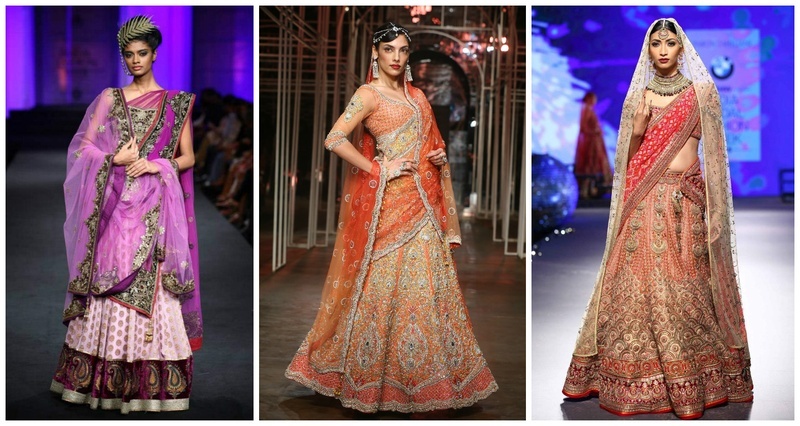 And there always remains the question: sophisticated saree or stylish lehenga? Well what if we told you that you could have both. Doesn’t that seem ideal? Not only are lehenga-sarees a class apart from what you would normally try to hunt for, but they happen to be quite trending right now. From Manish to Tahiliani to Ritu Kumar, they’re all incorporating this fabulously unique design in bridal wear and honestly, bridal fashion has never looked better! The sweep of the pallu along with the flare of the skirt adds just the right amount drama that you need on your upcoming big fat Indian wedding. Pair that up with the right footwear and some stunning jewellery, and voila; we promise you, you’re going to be looking drop-dead-gorgeous. What’s more is we’ve already done the job and found more than 30 fabulous lehenga-saree designs of some of the top-notch designers in the country to help you with all the info and inspo that you would need. So what are you waiting for? Keep scrolling for some of the most trending bridal designs of the season!